I love blue nail polish and my absolute favorite blue of all time has to be Essie Butler Please. But although that color is to die for, the formula is incredibly crapy. So I'm always on the hunt for a polish that gives me color like Butler, but with a much better formula. I had high hopes for the polish I'm showing you today, let's see if I found my perfect version of Butler. 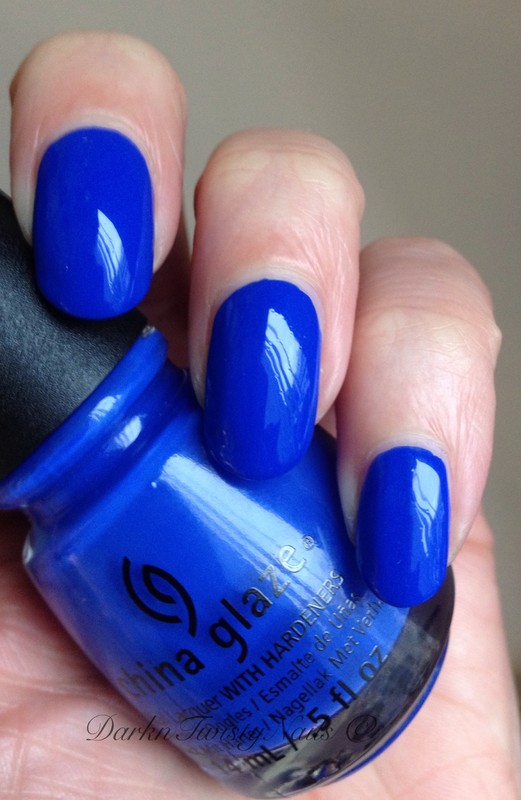 China Glaze I sea the point is a bright, in your face blue cream polish. This was released as part of the Off Shore Summer 2014 collection. The formula, I was crossing my fingers when I was painting this and although it's not a bad formula, it's not perfect either. Its a little patchy because it dries extremely fast, so working quickly when applying without going over the same spot too often is a must. It does level nicely while drying though and it's opaque in 2 thin coats. I love this color (duh! ), it's bright blue, but it's a little dustier than Butler. It reminds me more of Sally Hansen Pacific Blue (old formula), but it's not quite the same either. They are however all 3 close enough so you don't need all of them, except when you love blue polish as much as I do, than I'd totally recommend getting all three! The biggest plus though for this polish, is that this didn't stain my nails! Normally when I apply a vibrant blue polish, I have to double up on base coat, or accept the fact that I'm going to look like I killed a Smurf for a couple of weeks. This one was easy to remove without any staining. Even though this was released a while ago, it should still be available at the normal China Glaze selling points. If you love blue, you need to give this a try! Wat een prachtige, intens blauwe lak! En de glans is ook erg mooi. The colour on this is lovely! I'm a big fan of blue too, I don't know what it is with blue but I'm always buying it. I'm loving Illamasqua polish in Noble at the moment with Blizzard over the top, very wintery. That sounds like a wonderfull combination! I can't get my hands on Illamasqua anymore, something with the UK not shipping polish overseas... but I do have quit a few on my wishlist for the time I'm visiting London!